What is so special about the Cosmosun lamp range? A consistently sophisticated lamp range for all tanning needs and in almost every desired wattage. Cosmosun delivers great tanning results at medium to short tanning times and a useful service life of up to 600 hours with a largely constant UV output. 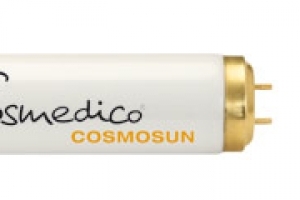 The reliable lamp operation is another special feature of the Cosmosun tubes. Do you want to bring a little colour into your salon? No problem! The low pressure colour lamps “Duo” and “Trio” are also part of the well-rounded Cosmosun range.